What's more, Xara Cloud includes a constantly growing number of templates that you can edit and publish (or save to PDF) within Xara Cloud without even running the desktop software - such as presentations, catalogs, flyers, product sheets, e-books, social media headings and CVs. So for example Web Designer owners can create flyers and product sheets and Photo & Graphic Designer owners can create presentations! 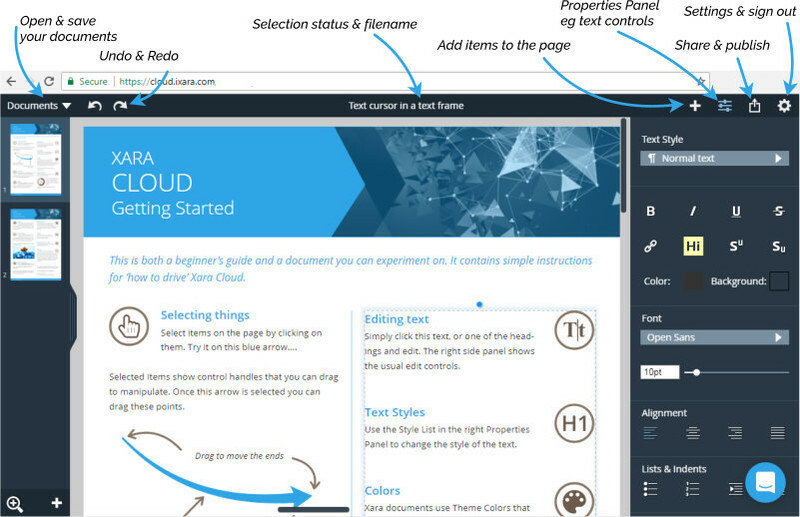 Why not browse the Xara Cloud templates and see what new things you could do! The Premium version of Xara Cloud also gives you the ability to work on Xara documents and sites or Xara Cloud templates in collaboration with friends, colleagues and clients, commenting and editing together in real-time. You can start using Xara Cloud right now by registering / signing in at cloud.ixara.com. Select one of the templates and you'll be shown our short Intro Tour. Then you are ready to launch - select Documents > Open and you can select a template or load any Xara documents stored in your cloud drive (Dropbox, GDrive, OneDrive). You can start using Xara Cloud right now! Register / sign in at cloud.ixara.com select any of the templates and follow the short Intro Tour. Then you're ready to go: access your Xara docs via Documents > Open. On first sign up you'll be able to try the Premium version free for 30 days, and even after that you'll still be able to use the Starter version of Xara Cloud for free (check the Premium benefits). And many more in our complete YouTube playlist. Discover the latest updates to Xara Cloud here. Check out the templates included in Xara Cloud here. Run into problems? You can find further support articles here or simply hit the Chat icon on that page.